Mauricio Pochettino has drawn on the works of William Shakespeare to explain he wants to stay at Tottenham and his star players are keen to join him. Pochettino has three years left to run on the five-year contract he signed in 2014 but Spurs are eager to tie their head coach to an even longer deal. He has led Tottenham to second in the table with six games remaining, and while Leicester are in pole position to clinch the title, Pochettino’s crop of young talent could have the club challenging for many years to come. Ensuring this season is not a one-off, however, will depend on chairman Daniel Levy keeping Pochettino and resisting the temptation to cash in on the likes of Harry Kane, Dele Alli and Eric Dier. Pochettino admits his own future is in Levy’s hands and recited the famous lines of Shakespeare’s Hamlet to illustrate his point. “The difference between when you are a player and when you are a manager is when you sign a contract as a player, if you want to be (there), you are,” Pochettino said. 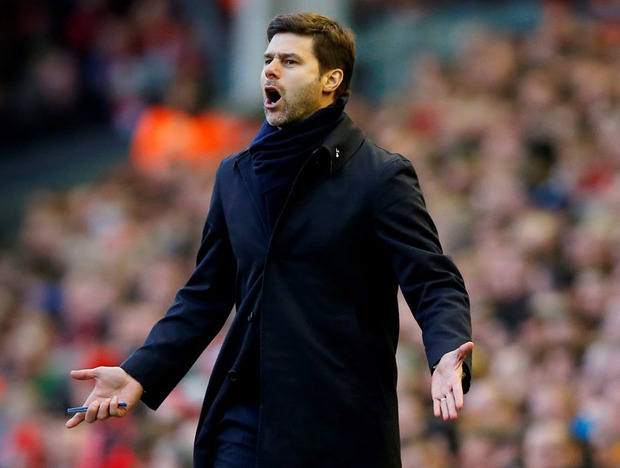 Pochettino has always remained positive about his future at White Hart Lane, despite reports suggesting Manchester United may be interested, but ahead of Stomorrow’s meeting with the Red Devils, the Argentinian was more forthcoming. “Do I want to sign a new contract? Yes, why not?” Pochettino said. Asked whether he was eager to develop Tottenham’s potential, he said: “Yes because I think you build a new stadium, you start to build the relationship, emotional relationships. “I think we are a team of people, it is not only important the money. It is important the emotional link you create with the people here and sometimes it is difficult to take some decisions. Pochettino chooses not to hire an agent, instead conducting his own negotiations on behalf of both himself and his backroom staff. “The best agent for me is myself,” Pochettino said. “As a player yes I had an agent but as a manager, when I stopped playing football, I stopped my relationship with my agent. Pochettino has become a valuable asset but so have a number of Tottenham’s players, with Kane, Alli, Dier, Hugo Lloris, Toby Alderweireld and Mousa Dembele all amongst the league’s top performers this season. In the past, Spurs have sold their star names – Gareth Bale, Luka Modric, Dimitar Berbatov and Michael Carrick have all left in recent years – but Pochettino has questioned why any of his current group would want to leave. “I think the players are very happy here,” Pochettino said. “It’s impossible to say nothing in the future but be sure the players want to stay here, the players want success here in the future all together because their morale is great. Pochettino also explained his reference to England’s greatest playwright, recalling the first date he shared with his now-wife when he was a player. “It was after a game and it was Shakespeare and I was very tired,” Pochettino said. “We were in the cinema and the film started - it was very boring, no?